If you are anything like me, you can be found cursing your alarm clock as it screams in your ear at 5:00 in the morning. After you have finally surrendered to said alarm clock, it is on to the morning workout, getting ready for the day and gettin that bootay in work mode. Time is limited in the morning and with all of the running around, making a healthy breakfast is usually not an option. Well my friends, this is where Mammoth Bars came into my life and made getting ready in the morning a lot less hectic and a whole lot healthier. So what's the big deal about Mammoth Bars? 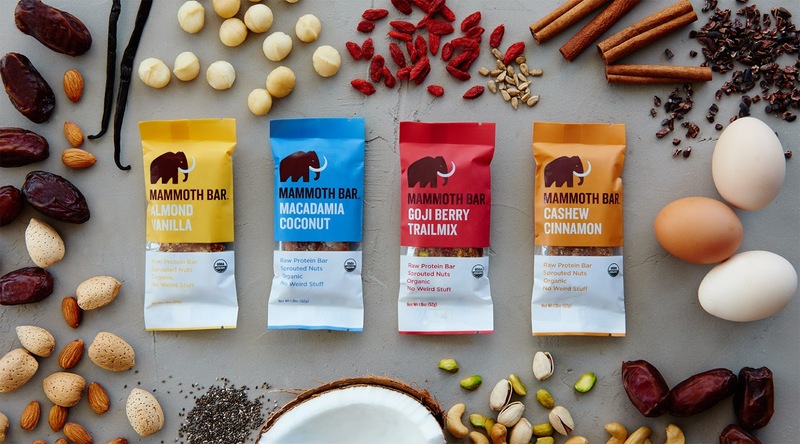 Other than being delicious and satisfying, Mammoth Bars are Paleo, raw, certified organic, gluten free, dairy free, soy free, non-gmo, no added sugar. What does all of that mean? It means easy on the gut and easy on the digestive system which is exactly what we want for our bodies. Another plus? More protein & less sugar are how these bad boys are made. Did you know that a little sugar actually helps your body absorb nutrients? As the Mammoth Bar company states, just as a bit of sugar can be beneficial for you too much sugar can shut down your absorption rate and transform excess particles into fat storage or "gunk" along your intestinal wall. Ewww! Fat from whole ingredients are alive with healthy nutrients that actually lower cholesterol, improve brain power and stave off heart disease. Eating strange junk that is processed or genetically modified in a lab, destroys nutritional value and gets transformed into fat storage that just sits in your system. What I love most about these bars are in fact that they do not have that fake sugar taste and tons of sugar added that many protein bars consist of now. These bars are chewy with a bit of crunch that comes from the nuts and seeds that are incorporated into them, balancing each other out very nicely. Another big pro for me was that these bars can be ordered by the box (10 bars per box) according to flavor, or if you can't choose which flavor you love more (like me!) you can order a variety box as well. So we have healthy, all natural, delicious (my favorite flavor being the cashew cinnamon), protein packed, good for on the go and made to order?! It doesn't get much better than this ladies and gents! Grab your Mammoth Bar today HERE and let us know what your favorite flavor is!